In the nearly five years that “We the People” has existed, 268 petitions have reached the signature threshold to require a response from the White House. The White House has written 227 different responses, although three more were pending as of the time data for this report were collected.7 These numbers are not equal because the White House will occasionally issue a single statement in response to multiple petitions dealing with similar subject matters. For instance, the White House used a single message regarding gun violence as a response to more than 30 different petitions requesting action on gun control. The nature and length of the White House response tends to vary significantly. The average response was about 400 words. Some were much longer – such as a 1,200 word response in 2011 about the Obama administration’s immigration plan. Others were quite short, such as a 54 word response in 2012 saying the White House could not comment on an investigation of former Sen. Chris Dodd for allegedly bribing politicians. Critics of the site have charged that the White House often takes a significant length of time to answer some of the petitions that have met the signature threshold. 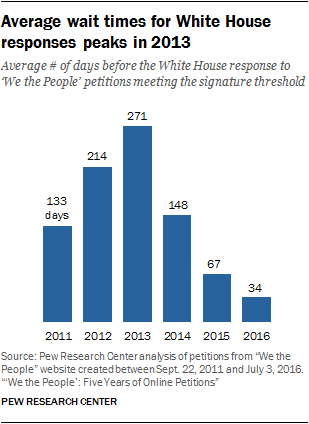 The Pew Research Center analysis finds that the average length of time from when a petition has reached the signature threshold to the time the White House has issued their response is 163 days, or more than five months.8 But response times have fluctuated substantially in the five years the site has been operational. For the 72 petitions created in 2011 that met the signature threshold, the average response time was 133 days. The average response time increased in the following years: to an average of 214 days for petitions posted in 2012 and to 271 days for those created in 2013. During this time, a number of observers publicly criticized the White House for their slow responses. In August 2013, a technology research fellow at George Mason University named Eli Dourado created a site that tracked response times and aimed at “helping the White House keep its promise.” In June 2014, Professor Dave Karpf of George Washington University declared the site a “virtual ghost-town.” Two months later, Time magazine published an article focusing on 19 petitions that were still awaiting replies. Starting in 2014, average response times began to decline: Petitions created that year received a response in an average of 148 days. And on July 28, 2015, the White House made a public effort to further improve response times by issuing responses to 20 petitions that had gone unanswered. Some of those petitions, such as the request for Obama to meet with conservative talk show host Neal Boortz to discuss tax policy, had met the signature threshold more than two and a half years earlier. That same day, the White House announced a change to the way they would be responding to petitions. Chief Digital Officer Jason Goldman wrote that the White House promised to respond to new petitions within 60 days of meeting the signature threshold and that the White House had assembled a “new team” to monitor and respond to petitions. From that point on, the response time did decrease significantly. For petitions created from that day through the end of 2015, the average time was down to 45 days. And for petitions created during the first half of 2016, the average response time was 34 days. At the same time the White House was taking these steps to improve response times, other data suggest there has also been a change in the way these responses are written. In the early years of the site, the vast majority of responses were written by specific members of the White House staff who were experts in their fields. These authors included people such as Joshua DuBois, the executive director of the Office of Faith-Based and Neighborhood Partnerships, and Felicia Escobar, the senior policy director for immigration. For responses written in 2011, 20 of the 27 (74%) included a named author as opposed to being unsigned or simply listed as “The ‘We the People’ Team.” In 2012, 95% of responses had a named author. In 2013, however, there was a significant decline in the amount of responses that were attributed to specific individuals. Just 33% of responses written that year had a specific name attached, and generic authorships became much more common. 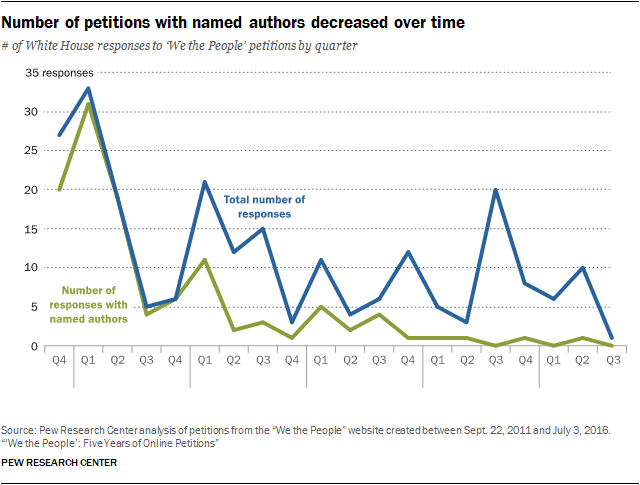 Indeed, this trend has grown even more pronounced over time: For responses written in 2015, only 8% of the petitions had a named author. And for the first 17 responses written by the White House in 2016, only one had a named author – a statement regarding the ownership of AR-15 guns written by Vice President Joe Biden. While several petitions have received media attention, including the request to build a Star-Wars-inspired Death Star and a 2016 petition asking for the arrest of Donald Trump for “incitement to violence” amongst his supporters, few have had clear policy impact. Perhaps the most famous petition was one created in November 2012 requesting the U.S. government to begin construction on a Death Star – a large weapon appearing in the Star Wars science-fiction movies. Since it was posted while the site was new, the petition generated notable media interest and served as an example of citizens using the site for petitions without a realistic goal. The White House website points to three instances where a petition led to concrete legislative outcomes. The most direct link between “We the People” and legislation was a January 2013 petition regarding consumers’ ability to “unlock” their cellphones in order to use them on different wireless carriers. In 2012, the Library of Congress decided the act of unlocking one’s cellphone would be removed from a special exemption and therefore become illegal. The petition, which received 114,322 signatures, asked for the decision to be reversed. Congress passed legislation that allowed consumers to unlock their cellphones and Obama signed the bill into law in August 2014. The White House also credits a 2015 petition for changing the president’s position on conversion therapy efforts on minors in the LGBTQ+ community. Obama decided to support state laws that would ban the practice. And the White House also says a decision to give baseball Hall of Famer Yogi Berra the Medal of Freedom was largely the result of a May 2015 petition. In an additional instance, one of the most popular petitions had a direct influence on Obama’s media appearances. The fourth-most signed petition on the site was a January 2016 request for Obama to appear on HBO’s television program “Real Time with Bill Maher.” While the White House originally declined the request, Obama later accepted the invitation and appeared on the show on Nov. 4, 2016. The White House has made several other attempts to highlight the site and its place within the larger Open Government Initiative. In July 2015, the administration posted a video of a meeting of several active users who were given the opportunity to spend a day at the White House. And as early as 2013, the White House made the programming code for the site open-source and freely available to the public, thus encouraging the programming community to create their own software that connects with or copies elements of the petitioning system.